Who says thirteen is an unlucky number? Night thirteen of the vaunted Herschel Project turned out to be right lucky for your old Uncle. Not that there weren’t a few black cats and walked-under ladders along the way. Seems like with Unk there is always something; every observing run is an adventure. The evening started gamely enough. For once, there was absolutely no doubt the weather would cooperate. Not only were the skies dead clear, it was obvious they would stay that way. Wunderground.com predicted Saturday evening to be cloudless and was prognosticating the same thing for the whole of the next week. Just when it seemed as if fall would never arrive on the Gulf Coast, here it was. Course, that means we begin to lose what I consider the perfect temperature forecast for long observing runs, “mid sixties.” By the time I arrived at our dark site, an airstrip that’s unused at night, there was a chill in the air. That was OK; for once, I’d had the good sense to listen to Miss Dorothy, and at her urging had brought along an honest-to-god coat, not the fleece I’d started out the door with. Speaking of Miss D., those of y’all who’ve given us your support and kept us in your thoughts through her battle with cancer will be pleased to hear she is very much on the mend. She is still weak as a kitten, and has a ways to go yet, but is feeling more and more like her old, wonderful self with each passing day. Anyhoo, the first thing I did, as I always do, was kick on the Thermacell mosquito repeller. It’s certainly gotten plenty of use this humid, buggy summer, and I’ve probably helped Bass Pro’s bottom line with my frequent trips there for refills. On this night, the skeeters were blessedly light, and my magic bug zapper easily kept the few refugees at bay. Only when I wandered over to a fellow club member’s setup at the opposite end of the field was I assaulted by buzzing biters. Frankly, I don’t know how I got along without a Thermacell. I will never, ever go back to slathering on the nasty, yucky DEET. It wasn’t surprising, given the beautiful weather, that I had plenty of company for this run, with at least five scopes set up on the field in addition to mine. I like that, though. I enjoy the quiet solitude of just me and one or two buddies, but it’s a nice change to have a night more like a mini-star party once in a while. Setup of my gear went smoothly at first. 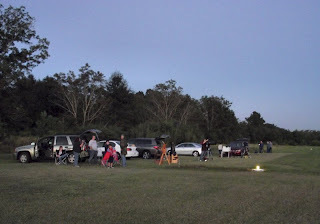 I need to get my 12-inch Dobsonian, Old Betsy, out of mothballs soon for a shakedown cruise in preparation for the visual observing I will do over the course of the fall star party season. Tonight, though? Nah. I am getting a little behind on the Herschels—my output has fallen, anyway—and the way to catch up is with my C8, Celeste, and the Stellacam II. The mount? This time I was back to my faithful CG5, who just delivers. She sure did that on this run—once I finally got going, that is. Yes, setup went smoothly—till I was putting the finishing touches on the rig. I’d got the OTA on the mount, all the cables hooked up, and the DewBuster and its heater strips connected to my jumpstart battery and ready to go. All that remained was to mount my f/3.3 reducer on the rear port, screw a visual back on that, and insert my Stellacam into the back via its 1.25-inch nosepiece. That was when the axe fell. I didn’t even have to look in the dry box that contains my accessories. I knew I’d forgot something. An important something. Yeah, yeah, I know. I always forget something, but usually it’s not anything critical (well there was that time I left the NexStar 11’s hand control at home, but it turned out cloudy that night anyway). This, unfortunately, was on the critical side. I’d had the C8’s visual back out of the box while I was working with the Hotech CT Collimator. Clear as a bell, I could see the consarned thing sitting on the dining room table. How in the hell would I connect Stellacam to scope without it? I thought for a minute. Didn’t I have a T-adapter with me? And a T to C T-ring for the Stellacam? That would work. Screw the T-adaptor onto the reducer and the camera onto that via the T-ring. The only thing that bothered me was that, given the presence of the 3.3 reducer, the camera would be right on the hairy edge of coming to focus. With the sky assuming that purplish shade it does on good nights, and plenty of bright stars visible, it was time to get aligned. Like always, I was using NexRemote running on my little netbook PC. As I use it, NexRemote takes the place of the NexStar hand control, with the computer connecting directly to the mount’s PC port (on Celestron’s port expander module). NexRemote works fantastically well, and there is nothing sweeter than using a Logitech Wireless Wingman gamepad as my “HC.” After having used a joystick to move the scope, I hate to go back to the stinky little buttons of the “real” hand control. NexRemote, in her Microsoft Mary voice, announced she was “acquiring” the first alignment star, Arcturus. When she stopped, that huge sun was visible on the screen of the portable DVD player I use as my monitor as the prototypal big SCT donut of an unfocused star. I mashed the appropriate button on my JMI motofocus hand control and the donut began to get smaller and smaller…almost there…almost there…until it reached the size of a nickel on my screen and refused to get any smaller than that. Was I sunk? Probably. Without the all-important visual back, I couldn’t even switch to eyepieces. I usually have a 2-inch SCT style diagonal on hand, a diagonal with an integral visual back, but I’d taken that out of the gear box, too, and set it aside for some foolish reason. Hey! Wait a minute. Maybe I did have a visual back with me. I rummaged through my case for a moment and retrieved my nice William Optics 2-inch visual back. A little more hunting turned up a WO 1.25-inch to 2-inch adapter. I removed the T adapter from the scope and the T ring from the camera, screwed the big visual back onto the reducer, inserted the 1.25-inch adapter into the back, and the Stellacam II into that via its 1.25-inch nosepiece. Arcturus was still far from focus, but pushing the appropriate motofocus button soon had the sparkler good and sharp. 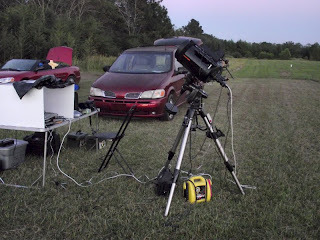 In fact, all the stars across the field looked very good, better than they do with my usual setup. Maybe the 2-inch adapter places the camera at a more optimum position behind the reducer than the 1.25-inch back does. Not that my focus didn't need a little fine tuning. I placed my Bahtinov mask over the corrector, tweaked focus by watching the diffraction spikes the mask generates, and was then almost ready to get to work. The rest was pretty darned anticlimactic. I did a two star alignment, added calibration stars till one of ‘em was on the screen and near the center when the slew stopped, and proceeded to polar alignment. Which doesn’t mean I used Celestron’s fancy new All-star polar alignment procedure. I still need to get friendly with that software, and I am used to and comfortable with The Old Way. Some CG5 users like the (optional) polar alignment borescope. I’ve never felt like fiddling with that consarned thing, and gave mine to a buddy who wanted it. For my money, the polar align routine built into the hand control (or NexRemote) software is more accurate. It’s easier to use, too: the scope slews to where it thinks Polaris should be given a perfect Polar alignment, you adjust mount altitude and azimuth to center Polaris in the scope, and you are aligned. I am told All-star is more accurate than the old procedure and doesn’t require you to redo your go-to alignment as the earlier routine does, so maybe I will give it a try next time out. The Polaris align is more than sufficient to yield round stars in the Stellacam video almost all the time, though. All my fooling around done (I hoped), it was time to get the run underway. Go-tos were outstanding all night long. They were maybe not as good as they could have been, however, since in all the flailing around about the visual back, I’d plumb forgot about the dagnabbed UP AND RIGHT rule. What’s they-at? All mounts have some backlash. Particularly inexpensive Chinese mounts such as your cheapskate old Uncle favors. For go-to to be accurate, the computer must know about this backlash. Meade accomplishes that by having you do “drive training” with the Autostar hand control every once in a while. 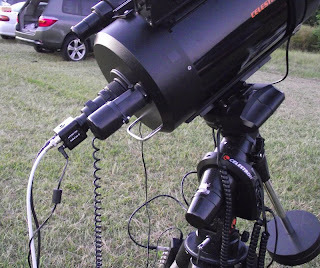 Celestron does the same thing by having you do final centering of alignment stars using only the up and right buttons, or, in the case of my joystick, only the up and right positions. Luckily for silly old me, the go-to system as implemented on the CG5 is pretty derned robust. Despite my faux pas, almost every object I requested was somewhere on the tiny Stellacam II chip. The few that weren’t, some far southern objects, were just barely off the edge, and that was not a problem once I knew which direction I needed to nudge the scope to bring them into view. I accomplished that by going to one of my fave summer objects, splendiferous globular cluster M22. It wasn’t on screen, but was easy to find with just a little slewing around. Informed as to how to bring any off-the-edge objects home, I hit the Herschels. How did I hit them? With the aid of my favo-right astronomy program, SkyTools 3. A quick check of ST3’s Herschel II list showed I’d once again missed the little Virgo galaxy I still need. By the time I finished fiddle-farting around, it was slap gone. It would be the Herschel I’s to start with, then. Virgo was gone, yeah, but when I looked up, the summer Milky Way was burning with a vengeance straight overhead. There’d be no shortage of objects tonight. By the way, I am still manually punching object numbers into NexRemote rather than sending the scope on go-tos via SkyTools 3 with NexRemote’s “virtual port” feature. I tried that once with my NexStar 11, the last time I was at Chiefland, and the scope started acting screwy. I suppose I should try the virtual port setup with the CG5, but I’d already wasted a lot of time this evening and punching the numbers into NR is not a big deal. As always, “POSS” is the Palomar Observatory Sky Survey, galaxy morphological types are where possible given according to the de Vaucoleurs system, matter in italics was transcribed from my log audio recordings, and the images here are from the POSS since I'm too lazy to process my video pix into stills, yadda-yadda-yadda. First object of the night is a galaxy in Boötes, NGC 5676 (H.I.189), a magnitude 12.3 SAbc spiral. It is actually rather impressive; it is large at 4.0’ x 1.0’, is possessed of a bright central region, and shows some hints of arm detail. 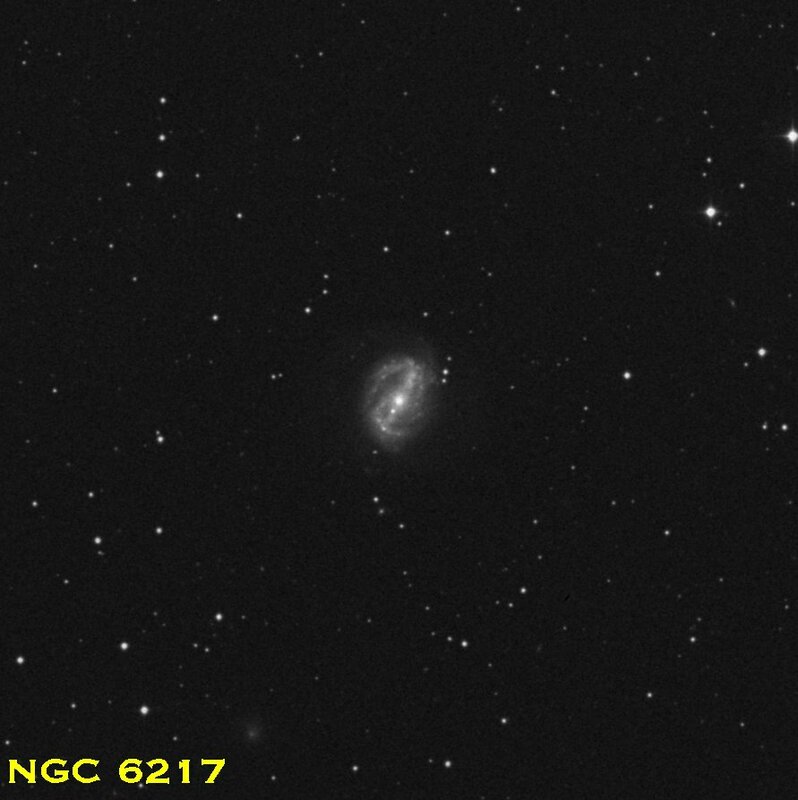 NGC 5689 (H.I.188) is also bright. It’s a magnitude 12.8, 3.5’ x 1.0’ long edge-on SB0, a lenticular galaxy. It displays a bright elongated core and a thin disk, which on the POSS plate looks slightly warped. 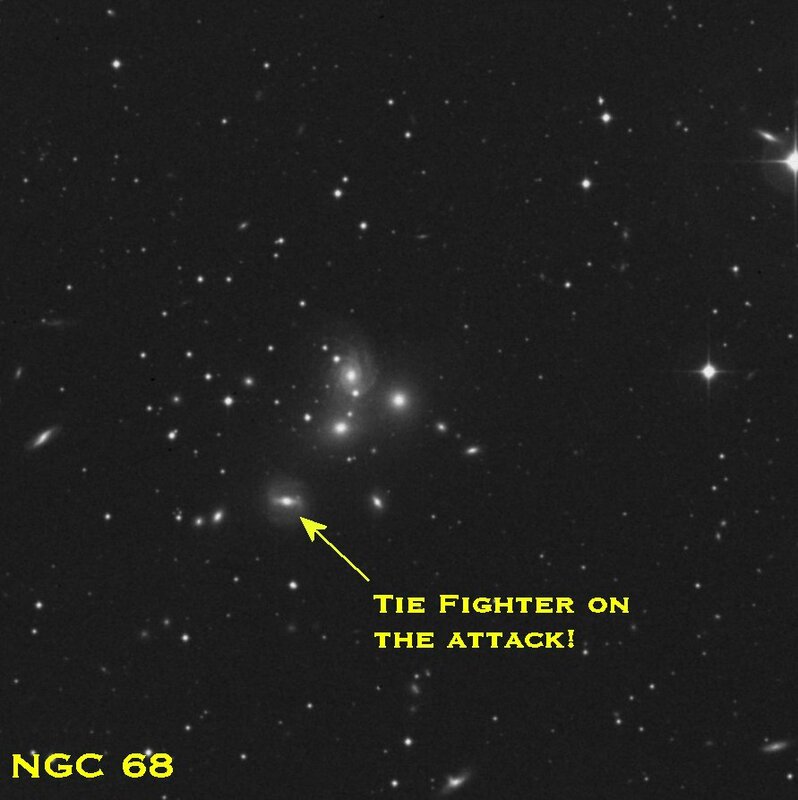 Magnitude 12.2 NGC 5557 (H.I.99) is 1.9’ x 1.5 in extent, so it is quite bright. Not much to see in this E1 elliptical, though; just a round blob surrounded by a little haze. Bright center, with a dim and small outer envelope. A magnitude 10 star is 5’ to the north. NGC 6426 (H.II.587), a globular star cluster, is much dimmer-looking than I expected. Had to crank up the Stellacam II’s gain to see much of anything. It’s a loose Shapley – Sawyer Class IX. Considerable resolution when seeing, which is not overly outstanding, cooperates. Magnitude 10.9, 4.2’. 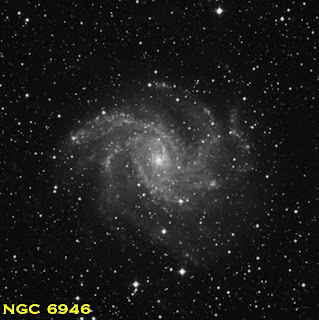 NGC 6517 (H.II.199) is another unprepossessing globular. It’s far more compact 6426, with a Shapley Sawyer class of IV, but it’s small, 4.2’ across and relatively dim at magnitude 10.9. No wonder I didn’t see it visually last time under poor conditions with it near the horizon. A few stars are resolved on my monitor tonight. In contrast to the two previous globs, NGC 6356 (H.I.48) is quite a treat. Magnitude 8.2 and large, 10’. Lovely, with many tiny stars shown. NGC 6342 (H.I.149), a magnitude 9.5 globular, is another small, subdued example of the breed. Some resolution evident, however, in this class IV cluster. NGC 6235 (H.II.584), a class X glob, would be easy to miss at magnitude 8.9 and 5’ in size. It is quite loose. There are a few stars scattered across its face, though it’s hard to tell whether all of them belong to the cluster or are part of the rich star field around it. A large, 20’ across open cluster, NGC 6633 (H.VIII.72) is pretty enough, but with the Stellacam II and C8, even at f/3.3, I really don’t have enough field to set off this rich group. 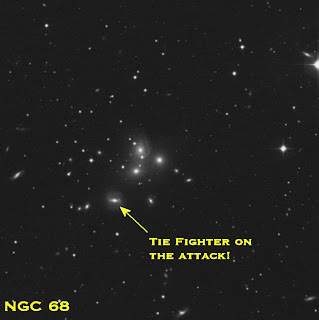 NGC 6664 (H.VIII.12) is a somewhat dim magnitude 8.9 open cluster. It is also reasonably compact, 12’ in size, and rich. 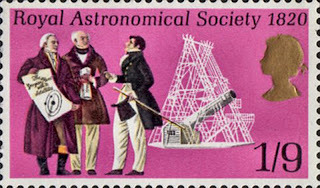 Unfortunately, it’s set in an already rich field and is not well detached from the starry background. On its POSS plate, NGC 6118 (H.II.402) is an impressive magnitude 12.4, 4.6’ x 2.0’ multi-armed SAcd galaxy. With my little C8, it’s still nice, with a bright core and fairly extensive and elongated oval outer envelope. There are only the barest hints of its many-armed nature, however. NGC 6946 (H.IV.76) is a beautiful, face-on SABcd spiral with its arms wonderfully evident on the monitor. This majestic galaxy looks like a blend of M101 and M83. Magnitude 9.6 and 11.5’ along its major axis. In a wide field telescope the nearby rich open cluster, NGC 6939, is visible in the same field as the galaxy, an unforgettable sight! Yes, there are deep sky objects in Ursa Minor, even if nobody (well hardly anybody) ever looks at them. NGC 6217 (H.I.280) is a nice barred spiral, a near face-on SBbc. On my monitor, it has the appearance of what I call a “Tie-Fighter” galaxy; its bar and “solar panels” make it look as if Darth Vader might be at the controls. Magnitude 11.7 and 3.0’ x 2.5’ in size. NGC 3147 (H.I.79) is a round, magnitude 11.4, 3.9’ x 3.5’ SAbc galaxy that, on its POSS plate, looks a lot like M94, the Croc’s Eye Galaxy. On my monitor, it’s a bright core with some fuzz surrounding it. NGC 6543 (H.IV.37), the famous (from its Hubble portrait) Cat’s Eye Nebula, is bright and elongated. Due to its relatively small size, however, 22”, there is not a whole lot of detail visible at this focal length. Some signs of interior detail/annular form. The C8/Stellacam do at least show a little more detail in this planetary nebula than is visible on the POSS plate, where it is completely burned out. Draco’s NGC 5982 (H.II.764) is a nice little round spot of an E3 elliptical galaxy. Magnitude 12.1, strongly elongated with 2.2’ x 1.3’ dimensions. What makes it cool is that it is sandwiched between two other galaxies. 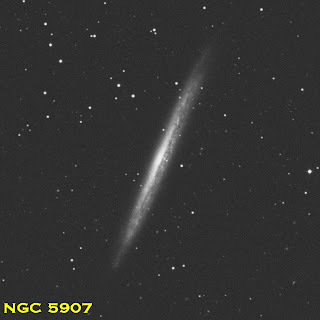 NGC 5985, a magnitude 11.9 intermediate inclination oval spiral, is just 7’26” to the east, and NGC 5981, a cute little magnitude 13.9 edge-on, is about the same distance to the west. The Splinter Galaxy, NGC 5907 (H.II.759), is amazing tonight. Easily extends a third of the way across the monitor. This skinny, magnitude 11.1, 12.8’ long SAc edge-on features a dark dust lane that’s easily visible with my deep sky video camera. NGC 5866 (H.I.215) is sometimes referred to as M102. Whether you think it is that, or whether 102 was just a duplicate observation of 101, this S0 is a nice object. It’s a magnitude 10.7, 4.7’ x 1.9’ edge-on lenticular and shows the flying saucer shape of bright galaxies of that type. NGC 523 (H.III.170-2) is all by itself in its field, but is very interesting anyway. This compact peculiar galaxy is obviously interacting with something; there’s a bright bar and considerable off-center haze. There may even be more than one galaxy here. NGC 68 (H.V.16) is a member of the impressive Y-shaped galaxy cluster Arp 113. Most of them, like this magnitude 14.1, 1.3’ x 1.2’ SA0 dust bunny are just round smudges with brighter cores, but what a view! 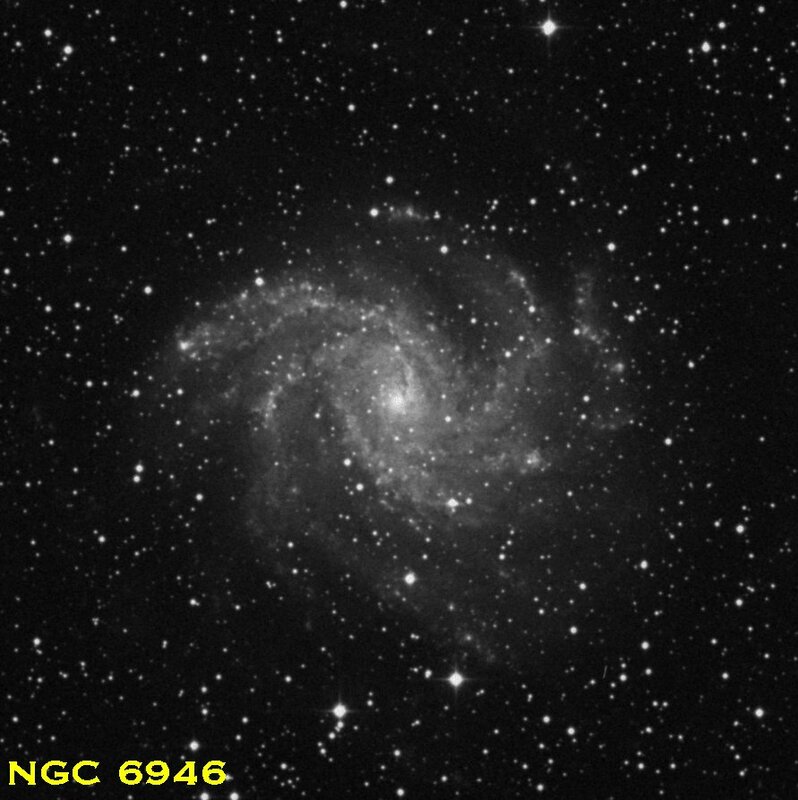 NGC 7741 (H.II.208) is a beautiful, classic barred spiral, a magnitude 11.8 Sbc that's 3.8’ x 2.5’. Its two winding arms are prominent with the C8 and Stellacam II, maybe even moreso than on the POSS. One of the best views tonight, NGC 7339 (H.II.234), an edge-on magnitude 13.1 SAB (s) bc spiral, is paired with the brighter and more well-known edge-on, NGC 7332, which is nearly perpendicular to 7339 and 5’ to the west. An unforgettable sight. Which caused me to holler “SUUWWEEEET!” alarming my fellow observers. And so it went, till the temperature sank way down into the forties (yeah, that is WAY DOWN for the likes of us), my batteries began to poop out, and a shot of Yell and a warm bed began to beckon strongly. 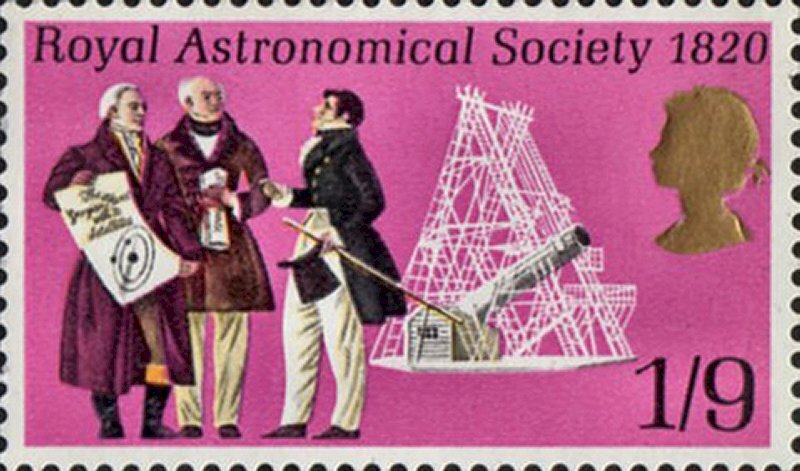 The night had begun with alarms and excursions, but it turned out fine, just fine, in the end, with me having bagged a grand total of 18 objects from the Herschel I and 46 from the Herschel 2500. Not an all-time high-score, but decent, nevertheless. Next Time: I can hardly believe it, but I got in another wonderful night with the C8/Stellacam the following weekend, crossing many more Herschels off the Big List. I also did some fussing, feuding, and fighting with Celestron’s new 4.16 GEM software, and you’ll get to hear all about that. Farther in the immediate future? We’ve got our big fall public outreach coming right up. And I’ll be getting Old Betsy tuned up for the next running of our favorite star party, the Deep South Regional Star Gaze, the first week of November. After that, it’ll be me and Miss D’s annual stay at the Hotel Monteleone in New Orleans. Then I hope to get down to Chiefland for a few days, and segue from there into the holiday season. Sounds like “fun” and “busy;” stay tuned, muchachos. Nice pretty pix for all us slower folks, Thanks Unk! As always, good to hear from ya. I'm glad to hear that the missus is doing ok. The treatments can be a bear. As you might remember from my other notes, we've been through that a couple of times in my family now. Thankfully, everybody is okeedokee at this point. I'm about ready to set up my C14 on a permanent mount. The boss was very nice to allow me to spend the bucks to extend out our deck to make room for it. Hopefully, in a couple of weeks, I'll only be lugging the monster out the yard one more time. In the burbs of Chicago, skies are not too great, but I'll be able to take a peak a lot easier once this project is done. New Orleans is such a great town. Been there a couple of times now, and always had a great time, and always ate too much.